The marquise diamond cut, also known as the football-shaped cut, the boat-shaped cut, the eye-shaped cut, or the navette, is rarely seen in the engagement ring world compared to other less vintage cuts. 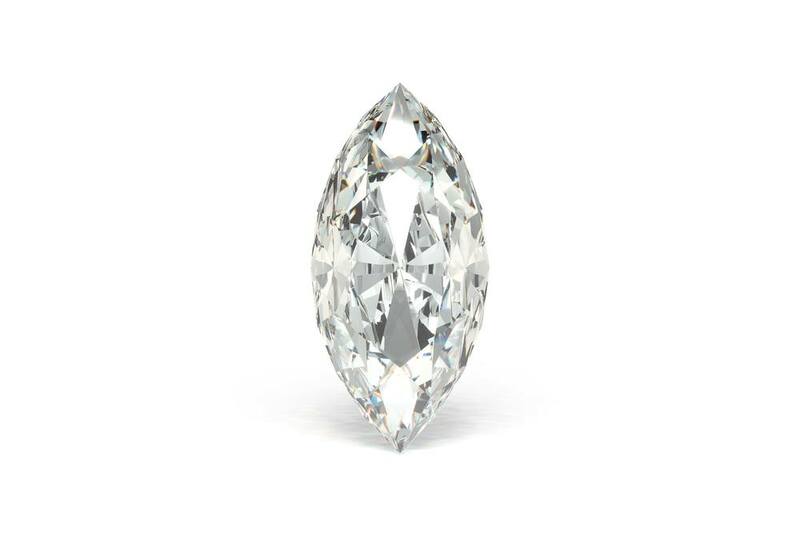 A marquise cut diamond features 58 facets and an elliptical shape with pointed ends. It has been around for centuries, and though it cannot brag the same level of popularity as the princess or round cuts, its traditional, long, narrow shape looks excellent on a ring finger. Though the marquise cut began as a cut for diamonds, it is widely used with other gems like emeralds, rubies, and sapphires. Slenderize Your Finger – Because of its long, narrow shape, marquise cuts are often credited for making a finger appear longer and more slender. Watch Out For Chips – The sharp ends of the marquise cut are often susceptible to chipping if not protected properly by the jewelry setting. 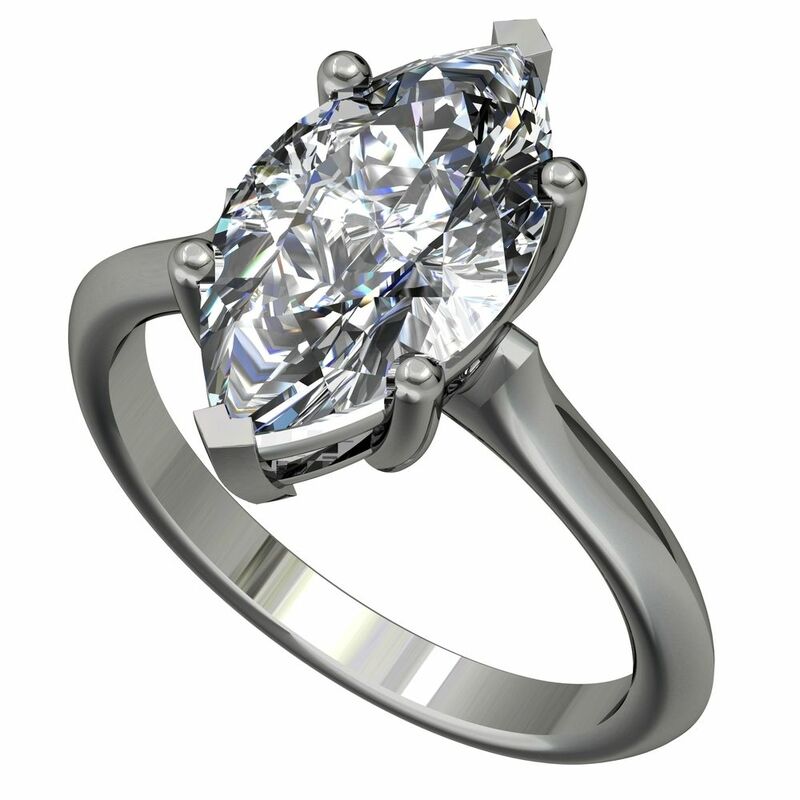 For a ring, make sure the corners have protected prongs or claws to keep the corners safe. “V-end” or “V-tip” prongs are generally considered the most secure. The Importance of Symmetry – The two points at the ends of a marquise diamond need to align perfectly with one another. The smallest imperfection of the symmetrical element of a marquise diamond will greatly affect the balance of your ring when it is finally set. Different Approach On Color – Because of their antique history and slender shape, many buyers might prefer marquise diamonds with a slight tint of color in them such as I-J graded diamonds, rather than colorless diamonds. Beware the Bow Tie Effect – With their narrow shape, some marquise cuts produce an area of reduced color in the center of the gem sometimes resembling a bow tie. All elongated fancy shapes have a bow tie effect, but a well-cut diamond will hide that effect with the brilliance of its facets. Ashley Simpson – Of the celebrities with marquise engagement rings, Ashley Simpson’s 5-carat stunner given to her by Hunger Games actor Evan Ross is perhaps the most unique and stunning. The Edwardian-style ring designed by Neil Lane features a 5-carat feature-cut marquise diamond surrounded by 12 calibrated rubies and 140 accent diamond melees. Victoria Beckham – When soccer star David Beckham proposed to Posh Spice, he gave her a marquise cut diamond ring set on a yellow band which cost around £65,000. Catherine Zeta Jones – The “Chicago” star wears a 1920s antique Fred Leighton ring with a large 10-carat marquise stone flanked by 28 smaller stones. Now that you know the rich history of the marquise cut diamond, you can consider choosing a marquise cut for your ring. Stand out from all the typical princess and round cuts that dominate the engagement ring market!